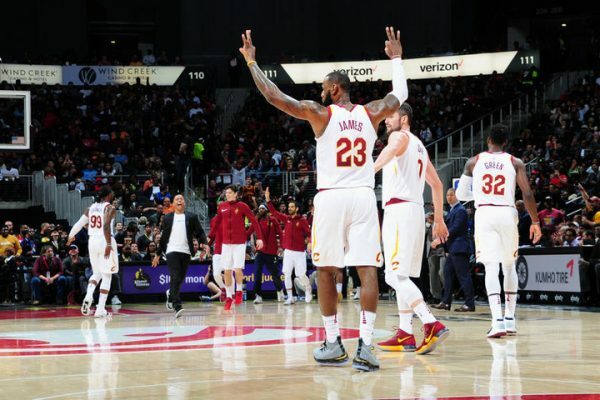 (Atlanta, GA) — Clutch play in the closing moments by LeBron James helped the Cleveland Cavaliers outlast the Atlanta Hawks by a score of 121-114 at Philips Arena on Thursday night. The victory now extends the Cavaliers’ winning streak to 10 games. The Cavaliers were clinging to a 113-112 lead with just under two minutes remaining when James drilled a 3-pointer with 1:48 left. 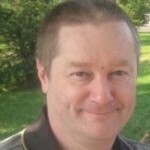 On the subsequent possession, he grabbed a tipped pass, which led to a basket by Dwyane Wade. After then twice splitting a pair of free throws, James delivered a block that helped put the game away. “When he’s playing like that, it energizes the rest of the team and they feed off of it,” Cavs head coach Tyronn Lue said of James. Both James and Kevin Love collected double-doubles on the night, with James scoring 24 and handing out 12 assists and Love scoring a team-high 25 points and hauling down 16 rebounds. Wade came off the bench to score 19 points and pick up four steals, while Jae Crowder contributed 15 points and Jeff Green delivered 12 points in a reserve capacity. As has been the case during this winning streak, the Cavs’ bench provided a boost on offense by scoring 46 points amongst five players. James was especially effective on defense during the second half, helping to slow down Atlanta’s Dennis Schroder, who was limited to 10 points after the break. That came after he seemingly scored 17 points with ease during the first two quarters. The team as a whole ended the night by hitting 18 3-pointers, with eight different players contributing to the three-point barrage. Love was the most prolific when it came to hitting from deep with four, though he was one of six players to hit multiple treys during the contest. “He’s taken a liking to the 5 because he knows he’s going to get some shots,” Lue said of Love. Also aiding the cause for the Cavs was improved second-half defense and solid ball movement throughout the game. In the latter category, Cleveland finished with a whopping 30 assists. During the first quarter, defense was an afterthought for most of the period, with each team starting the game by connecting on 9-of-13 from the field. The Cavaliers managed to stay in that range, finishing with a 67 percent shooting percentage while the Hawks cooled off to 54 percent. Those numbers allowed the Cavs to take a 42-35 advantage into the second quarter. That shooting touch faded for the Cavs in the second, dipping to just 33 percent in field-goal shooting. That drop, coupled with the Hawks upping their success rate from the field, allowed the home team to outscore the Cavaliers 30-14 over the first 10 minutes of the period. However, Cleveland scored seven of the final nine points of the half, including the final five, and headed to intermission trailing just 67-63. The Cavs connected at a 62 percent rate from the field during the third quarter, helping fuel a 19-7 run that gave them their biggest lead of the game at 94-82. On the defensive side, Cleveland limited Atlanta to just 23 points after two quarters of allowing over 30 points in each period. That allowed them to hold a 99-90 advantage with 12 minutes to play. The Cavaliers will return home for a Saturday night matchup against the Memphis Grizzlies, who changed head coaches earlier this week. Tipoff for that game is set for just after 7:30 p.m.